The writers/producers were really playing up the whole “increased diversity” angle with regards to the cast and, boy howdy, were they right. It’s uncommon to see any middle-aged white males in any given shot, though they certainly exist. This is a pretty stark leap from previous outings in the series, and a welcome one. Gene Roddenberry was adamant that his crew be constructed of a diverse group of people in the original series, complete with an alien, a Russian, an Asian American man and an African American woman, something unheard of in television of the time. 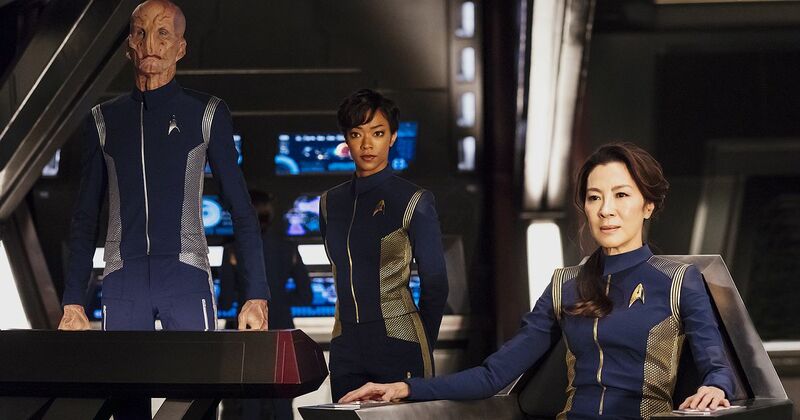 This Star Trek for a new generation has done a good job keeping up with that tradition, but I feel like the characters, overall, just feel more diverse than anything on TV now, even in today’s society where we’re more conscious of such things. The acting, overall, was really good out of the gate. I’ve gone back to DS9, Voyager and Enterprise over the years and, ooooooooh, that acting in the early seasons was uniformly bad. Honestly, for some characters, the acting never really improved even by the series’ end…especially in Star Trek: Enterprise. All of these actors seem really solid, though. The production values are still really good, despite this show being relegated to a streaming-only service (more on that later). It still looks pretty CGI-ish, though, so I long for the days when Star Trek still used real ship models. Still, that ain’t happening, so this is the best we’ll get. It all looks pretty good, though. I’m not a fan of having to spend $6/mo on another streaming service just for this show. But. I feel it’s necessary to put my money where my mouth is and support its presence. I could probably expand on this in a completely separate post, but a show like Discovery wouldn’t survive on broadcast CBS. Would it survive on Showtime, where ratings don’t have to be as big of a deal? Maybe? But then I’d have to pay for that, too, because I don’t have cable TV (and Showtime is $9/mo). Would I like it to be on Netflix instead? Absolutely! But CBS owns the TV rights to Star Trek: Netflix doesn’t. So it has to appear on a CBS property. So unless Discovery is going to be shown on the Smithsonian Channel (another thing I wouldn’t have access to…), this is likely the only reasonable option in the streaming age. The bridge sets are too big. They look bigger than the bridges on TNG, and this show is a prequel to the original series, after supposedly establishing that on Star Trek: Enterprise, the ship should feel like a “submarine” because it’s still early in interstellar travel. Along those lines, what’s with the hologram-style communications?! Use your viewscreen, dammit. This isn’t Star Wars! We only get 15 episodes out of this first season and I think it’s off to a pretty compelling start. Let’s hope CBS doesn’t have unrealistic expectations for this property, so it has room to breathe and grow in the streaming-only space! Next PostNext We Bought A Boat!